In every new mining project, there is much to be considered concerning the expediency of opening up through shafts, inclines or adits. More attention has lately been given to this subject than formerly. There are very good reasons for the selection of any one of these kinds of mine openings. The words shaft, incline, and tunnel have been handled with careless meanings by mining men. It is time that some definitions be accepted so that everybody will use these terms with the same meanings. A shaft has loosely been any steep opening sunk through the ground. An incline—sometimes spoken of also as an incline shaft—has been taken to mean an opening resembling a shaft, but not very steep and not approaching verticality. Right here, there has been too much latitude of speech and it has entailed the necessity of many awkward explanations. By a tunnel has been intended any (approximately) horizontal passageway driven from the natural surface. Objection to this use of the word rests in the strict definition of a tunnel, which states that it must have both ends open to the natural surface of the earth, as for example, an irrigation or a railroad tunnel. A level passageway which has but one end open to daylight is not properly spoken of as a tunnel. In mining practice, practically every horizontal opening of this nature is open at only one end, and it is an adit rather than a tunnel. If the precaution of speaking of it as a "mining tunnel" is observed, very well, for this may be taken to be an expression synonymous with adit. The latter term is, however, shorter and more correct. For the sake of a uniform usage, the following definitions are proposed. Their use will conform with the usages of those well-informed persons who adhere to correct speech. A shaft is a truly vertical mine passage which may, or may not, be sunk in or along an ore or a coal body. An incline is any mine passage which occupies a sloping position and which may, or may not, maintain a uniform inclination throughout its length. It may be sunk along, or in, a pitching vein or seam and it may thus conform to the irregularities of the dip of such body. It is neither horizontal nor vertical. Such an inclined passage following a seam of coal is known as a slope. It sometimes happens, especially in coal mining, that a sloping passageway is driven through barren rock either to get at known bodies by the shortest means or to establish uniform grades for tracks. In a strict sense, these are not inclines or slopes, for they do not even approximately follow, nor parallel, bodies of value. The miner's term for such an opening is rock slope. An adit or mining tunnel is a horizontal opening driven from the surface. If it be driven along an ore body, as a vein, it is properly called a vein adit; if it is driven across barren country to intercept presumed or known bodies, it is spoken of as a crosscut adit. All adits must be given a small amount of grade for drainage necessities. Before getting underground we should consider what is required in the way of opening our mine; what is positively known about our body of coal or ore; and what conditions are liable to confront us later on. We must consider the type of ore body; character of material to be extracted; average thickness and hardness of the body; desired tonnage; power facilities; probable surface and underground drainage to be maintained; and dozens of other things which only the experienced man will think of and appreciate. The right kind of a manager will know that he cannot afford to overlook such points. Every case involves different contingencies, and therefore extreme forethought must be given to the subject before deciding upon any particular kind of an opening into the ground for mining purposes. This remark does not apply to such openings as prospect drill-holes, openings which are not for mining purposes, but for exploitation. Assuming that sufficient data are known concerning the property to warrant the expenditures incident to the making of a mine, the question remains as to the best way of proceeding. It is a well-established fact that it is much cheaper to drive an adit than to sink a shaft of equal transporting capacity. It is also cheaper to drive an adit than to sink an incline. If the topography is such that an adit can be driven into or beneath an ore body and thus expose it from a low elevation, the temptation is strong and along lines of good practice to do so. If the country is quite flat or nearly so, or, if the surface is such that, while rough, an adit of reasonable length cannot be driven to tap the valuable mineral and handle it economically, then it is good practice to decide upon a shaft mine. An adit will not only be cheaper, foot for foot, than a shaft or incline, but, if given the proper, slight grade, it will afford a natural drainage outlet for all subsequent workings above its level. The cost of pumping, as already suggested, may be a considerable item and it may be a deciding factor in favor of an adit when this form of opening is possible. Furthermore, an adit will obviate the installation and use of hoisting machinery, and thus there may be maintained a greater efficiency in the operating expense of the mine than would be possible with a shaft. Again, it is a simpler and cheaper matter to maintain a mining tunnel in working shape than it is a shaft, particularly in bad ground. By the settling or "working" of the ground, a shaft may be thrown perhaps but slightly out of alignment and annoying interferences will be experienced in hoisting, especially when rapid and uninterrupted hoisting is necessary to maintain the desired output. 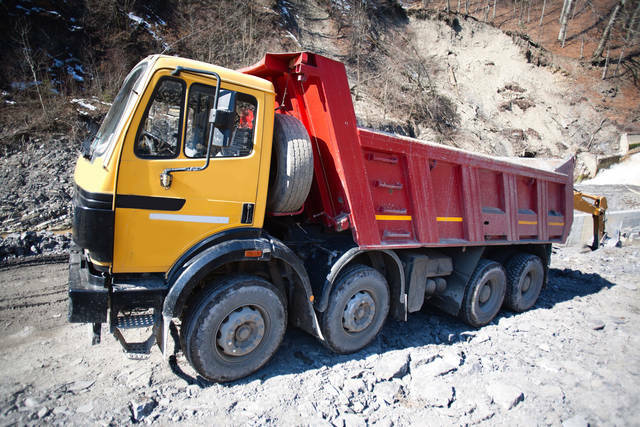 While the same amount of disturbance does take place in an adit, it is an easy matter to readjust track grades while continuing regular haulage operations. The timbers, in the case of either a shaft or an adit, will require occasional renewal, but the expense of such repairs is less in adits than in shafts or inclines, while the delay to other operations of mining, in the case of the adit, will be inappreciable. Topography has been referred to above, but it must be again briefly mentioned. There are some places in which ore bodies extend to, or exist at, such depths that adits could not be projected to get beneath enough of the ore to warrant their construction. An adit mine is not a practicable thing in a flat country like Nevada or the Rand, but in the rough country of the San Juan it is the customary kind of a mine. In the very early days of Comstock Lode mining, shafts were sunk by each of the hundreds of companies. Before a great while, the advantages that would accrue from having a deep "tunnel" became evident, and the famous Sutro Tunnel, with its historic, checkered career, was driven. Although it loomed up like a gigantic undertaking for that period, the immense prospective or future value of it could not be denied. With an incline, the value of a tabular deposit is determined as work progresses; the course and dip of the body will be known at all depths along the incline; the body may be explored from the incline in both directions, simultaneously, with a resulting doubling of the development and production; all, or nearly all, the material removed is "vein stuff" and its value may repay the sinking expenses; there is no losing of the ore body unless a geological fault is met. With a shaft, more rapid hoisting is possible than with an incline; the timbering labor is less than in the case of an incline, but greater than in the case of an adit; with ground containing ore bodies in irregular masses and at no uniform intervals, vertically or horizontally, stations and levels may be started wherever desirable; the crosscuts which are usually necessary to reach the bodies may disclose otherwise unknown bodies. With a vein adit, the vein is prospected as work advances; the ore removed may pay its own way, as it were; the drainage is automatic; ore is transportable from the mine by haulage rather than by hoisting; the ore in place is above the level and will handle itself to the outgoing passage by gravity. With a crosscut adit, in addition to the last three advantages noted for the vein adit, there is bound to be exploration of the ground upon at least one side of the known body; there will generally be easier haulage because of the straighter track, since an adit driven along a vein will conform to the geological irregularities and the track is bound to be more or less crooked. Without counting upon the doubtful success of the numerous propositions in tunneling machines, but judging only from past experiences, we may say that a shaft will cost about three times as much as a "tunnel" of equal transporting capacity. If the ground is wet, the discrepancy in first costs becomes much larger. In a remote region, with difficult transportation of machinery and fuel, it may be better to drive and use a long adit rather than a shallow shaft. An adit will transport more product than will a shaft of equal dimensions. An adit may be driven to intercept a shaft and to serve as a sort of artificial surface, as it were, and thus save expenses in pumping and in hoisting up to the original collar of the shaft at the surface of the ground. No matter how crooked an incline may be, it is possible to hoist ore in conveyances known as skips, although the hoisting may be necessarily somewhat slow. These same conveyances are useful for lowering and hoisting men, and the parody, "Men go down to the mine in skips," here finds its significance. The usual hoisting conveyances used in shafts are known as cages. They usually produce less friction than do incline skips. A skip in an incline must travel upon a track, while a cage, somewhat resembling a passenger elevator, has no wheels, but slides upon guides. However, an incline skip, because of the inclination of the passage, does not exert the same dead weight upon the cable and hoisting engine and hence these parts of the equipment may be made correspondingly lighter. Skips for shafts are similar to cages in their lack of wheels. Complete estimates of probable future requirements should be made before a shaft is sunk. When it becomes necessary to enlarge a single-compartment shaft to one with two compartments, the expense has been found to exceed one-half the original cost of sinking; while, to convert a one-compartment shaft into a three-compartment shaft costs fully three-fourths of the original sinking expense. Approximately the same ratios of cost will hold in the case of enlarging inclines. Character of ore sometimes influences the selection of the kind of passageway. Some high grade, brittle ores must not be dumped nor handled repeatedly, since values are lost in the "fines." Iron and copper ores will not probably be injured by any amount of dumping. Coal should be handled as few times as possible. In view of this fact, other things being equal, adopt that system that will injure the ore or coal the least. As a rule, workmen are safer in tunnels than in shafts, since there is little danger from objects falling any great distance. Tiny bits of rock have been known to kill men in shafts. On the other hand, there is less liability of injury from falls of large rocks in shafts than in adits. Roof falls are a very prolific source of mine accidents. The workmen of neighboring mines will often be able to give much valuable information as to the proper procedure in opening a new property. For instance, water levels, amounts and kinds of gases that may be expected, the nature of the wall rocks, and other pertinent points may be learned by interviewing the men who are employed in adjacent mines. Still better information may be obtained by personal visits to the underground workings of the nearby mines. In this connection, one must not permit himself to be unduly influenced by the prejudices or hobbies of the neighboring operators or their employés if there is reason to suppose that such notions are contrary to good practice. Due consideration must always be given to the selection of some method of opening up what might be supposed will never amount to a great mine, so that, should subsequent disclosures exceed expectations, enlargement of the scale of operations can be advantageously effected. Always bear in mind that legitimate mining is just as much a commercial enterprise as is any other kind of business. The utmost concern for financial showings must be constantly borne in mind. Select a scale of operations consistent with the known—not the hoped-for—bodies of coal or ore; but have a certain feature of elasticity about the plans that may take care of future increase in business if found desirable. Do not "over-plant." Never plant, at all, prematurely. It is better to postpone the installation of the equipment until some specific facts are available. Many companies have met defeat in the exhaustion of capital through the purchase and installation of elaborate plants which were never warranted. After a mine is once opened and preparations have all been perfected to operate upon a certain scale of output, it is quite essential that exploitation and production be maintained without material fluctuations, if the greatest economy is to be attained. Exploitation, i.e., development work, must be kept well in advance of actual mining operations to assure plenty of working space for the extraction of the normal output.